I've been getting into fountain pens lately. I bought my wife a Lamy Safari (Neon Coral) and she loves it. I also got myself a Pilot Petit1 and a few Platinum Preppys to play with. So I thought, maybe I'll get something that looks a little nicer, less plastic, but still cheap. I wanted a pen I could use at work, but if I left it in a conference room I wouldn't be that upset about. I thought about the Fountain Pen Hero 616 , which is a Parker 51 knock-off, but I don't like the look of the hooded nib. 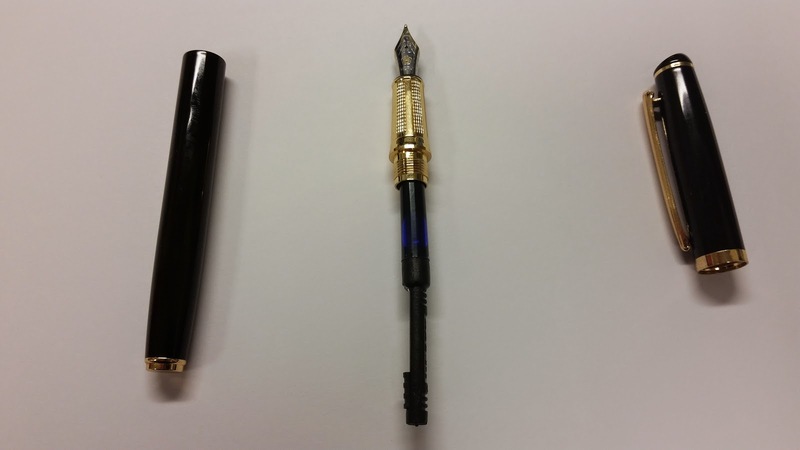 Instead I saw on Amazon a Hero Fountain Pen 9201 . 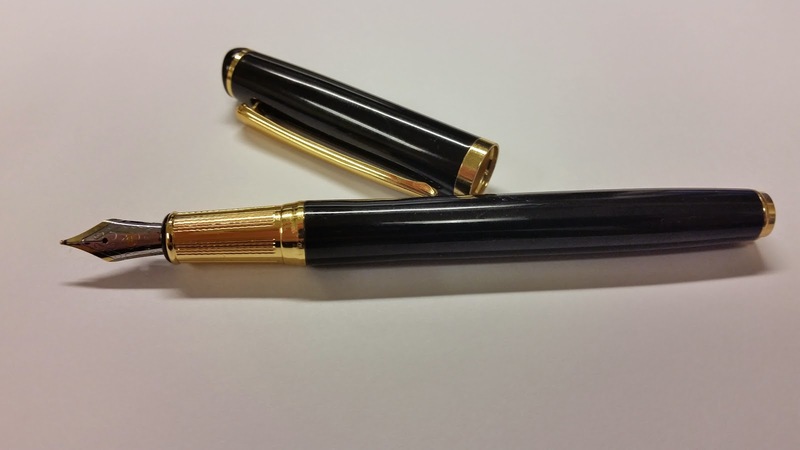 Nice black pen with gold looking features and a built in converter. I did a little looking online but found no real reviews of this pen. Since it was cheap I pulled the trigger. 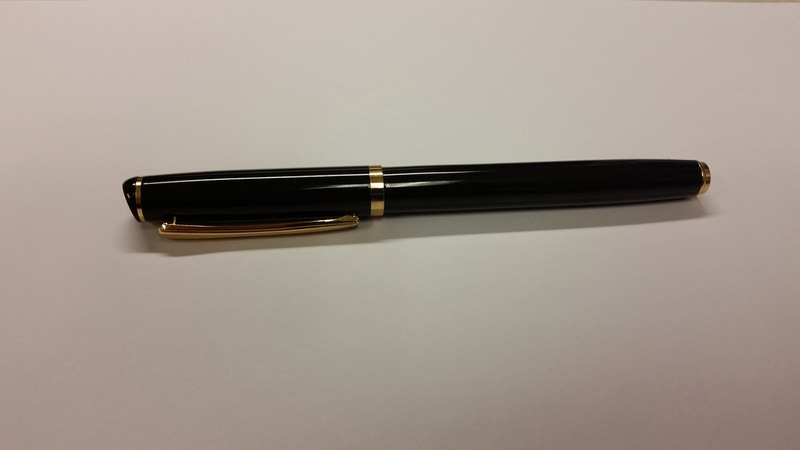 A simple classic looking black pen. Nothing remarkable, but better looking than a plastic Bic or Uni-Ball. Respectable weight, and i like the feel unposted. Posted it's back heavy. There is also an overly tight clasp that I can't seem to attach to anything. The pen comes with a converter. The converter doesn't use the usual twist piston but instead has a slider attached to the piston. Loading it with Noodlers Baystate Blue took about four piston pumps up and down and its still only about 70% filled. The nib is nice looking. the gold around the grip is textured. Again, unposted its got decent hold and balance. It writes like crap. I'm new to using a fountain pen. 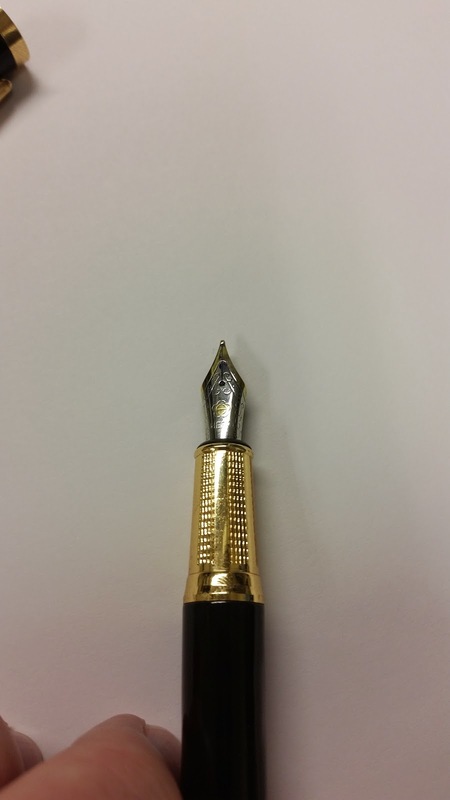 My Pilot Petit1 is very smooth, and a bit overly wet, but I enjoy writing with it. This thing is scratchy, hard to start, dry, basically everything bad about a fountain pen rolled into one. 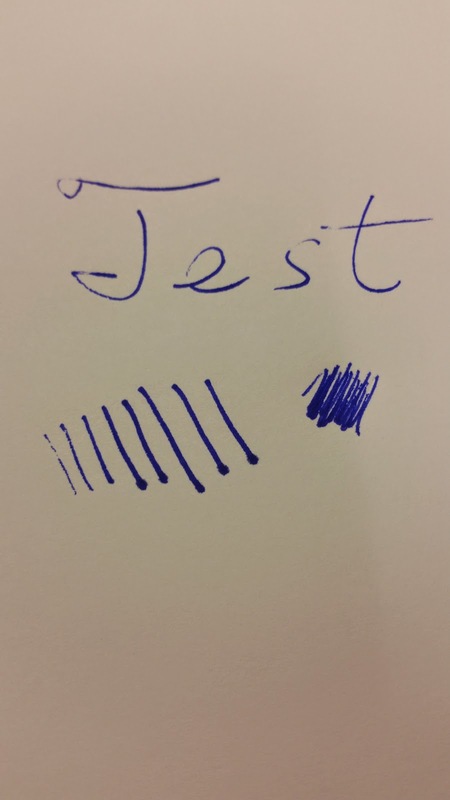 There is a tiny bit of flex in the medium nib, but it starts and stops constantly at a decent rate of writing. In some cases most of the first word is just missing and I have to find scrap paper to get the pen going again. I hate it. Its junk. Its like a dried up ball point you get at a hotel. Save your money folks, a Platinum Preppy writes way better for half the price. Otherwise get a cheaper Lamy and be happy.